Scotland's national emblem comes to life in this beautifully handcrafted drop pendant. This stylish pendant features a single thistle encased within a simple oval border. 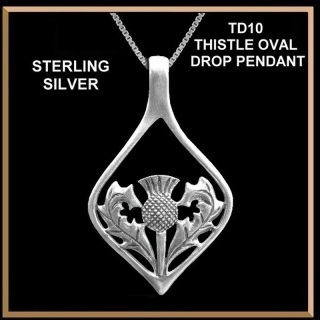 This oval thistle pendant is a great looking pendant from any angle. Measurement: 1-7/8" by 1-1/8" (49mm x 29mm). and includes an 18" high quality chain.